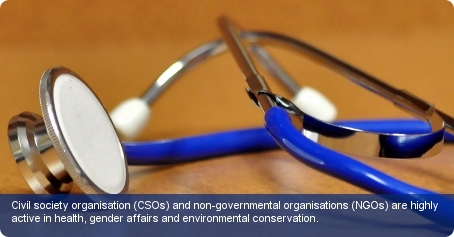 Civil society organisation (CSOs) and non-governmental organisations (NGOs) are highly active in health, gender affairs and environmental conservation. The NGO/CSO community and the Government have worked in partnership to address the needs of women. Organisations such as the Belize Organization for Women and Development, Women’s Issues Network of Belize, and the Belize Women’s Political Caucus are active in this arena. They facilitate and advocate for gender empowerment policies, advise women on their rights and provide counselling. In the environment sector prominent NGOs include the Belize Alliance of Conservation NGOs (BACONGO), the Belize Audubon Society and the Programme for Belize. BACONGO, which represents a variety of environmental NGOs, has been involved in a number of highly publicised environmental conservation lobbies. The Non-Governmental Organisations Act (2000) outlines rules for the financing and operation of NGOs. The registration of NGOs is carried out by the Solicitor-General or the Registrar of NGOs, as appointed by the relevant minister. As of 2007, there were 82 registered NGOs. The role of civil society in the country is entrenched and well recognised by the government. An amendment to the Belize Constitution of January 2002 allowed for expansion of the Senate to incorporate a seat for civil society; enabling civil society to have a voice at state level. The ten major trade unions in the country are represented by the National Trade Union Congress of Belize (NTUCB), which was founded in 1966. It is linked to the Caribbean Congress of Labour (CCL) and International Trade Union Confederation (ITUC). Members are from all corners of the economy.